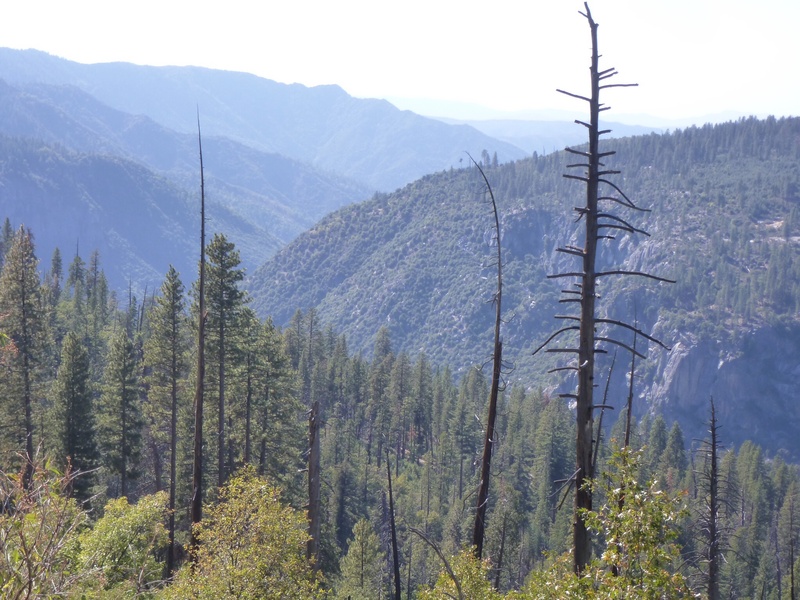 Indian Flats to Oakhurst. 62 miles 6200ft climbing. We had left it open the night before as to what we would do today, depending on how we felt after our long day. 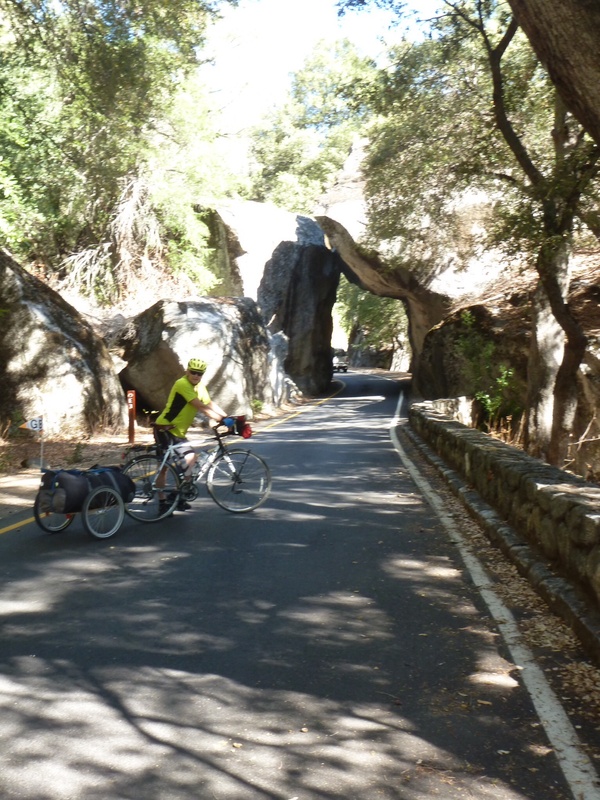 We could either climb back up into Yosemite or there was an alternative route along the Merced River round to Oakhurst. 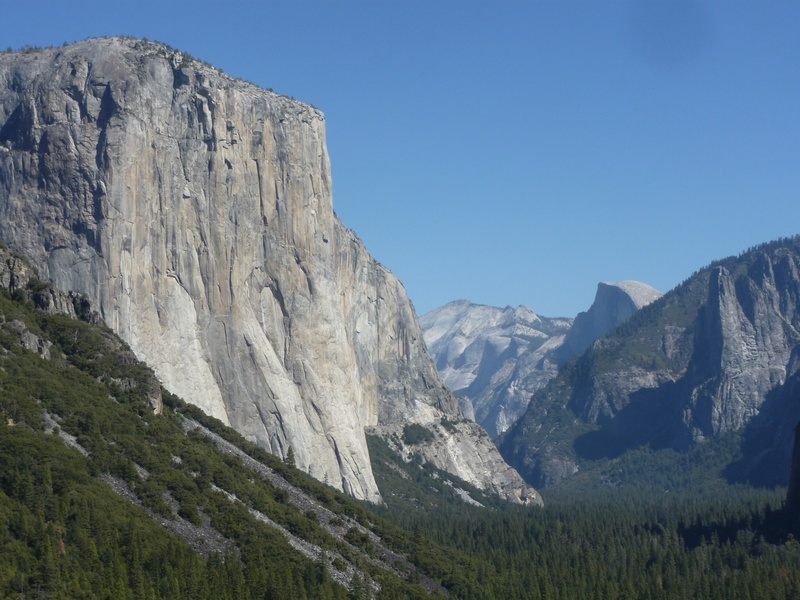 The problem with the “alternative route” was that we would miss out seeing Yosemite Valley, but getting to Yosemite meant a climb. As it was we both felt pretty good in the morning so opted to go back via Yosemite, even if it meant climbing 2000ft back to where we left the route we had been following since Vancouver. 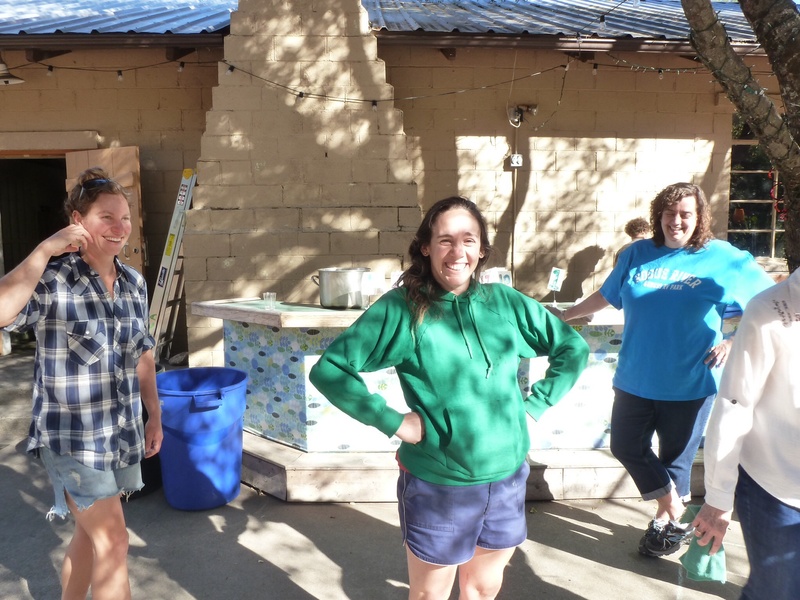 We stopped a few miles after the gentle start along the Merced river at El Portal to get provisions and see if we could link into the internet. The shop didn’t have a link but we were told there was one at the community hall round the corner. There were a few people around the hall just as we got there, and were told they were setting up for a wedding that day. When we asked who was getting married the very cheerful and very laid back looking girl in shorts said ‘me’! But being the US she said of course come round and use the internet and we logged in while they were getting the tables ready. We got invited to stay for the wedding by a woman who was the aunt of the groom, but felt that this was not perhaps the time to intrude. So we thanked everyone, took pictures of the bride to be (whoaleady sprted a wedding ring) and then we said our goodbyes and good lucks. The section back up into Yosemite was along the Merced river. We had been too tired (and on the wrong side of the road) to really see it the evening before. We saw it as a gentle meandering river trickling around enormous boulders that had been torn from the towering cliffs above. This was at its lowest level after the hot summer and before the autumn and winter storms. It must be quite a sight in full flow. The climb wasn’t as bad as we were anticipating and at the entry gate the ‘patter’ was the same. The park is still closed, no stopping, no moving away from the road, all facilities closed etc. But all said a bit tongue in cheek as he knew we would stop! 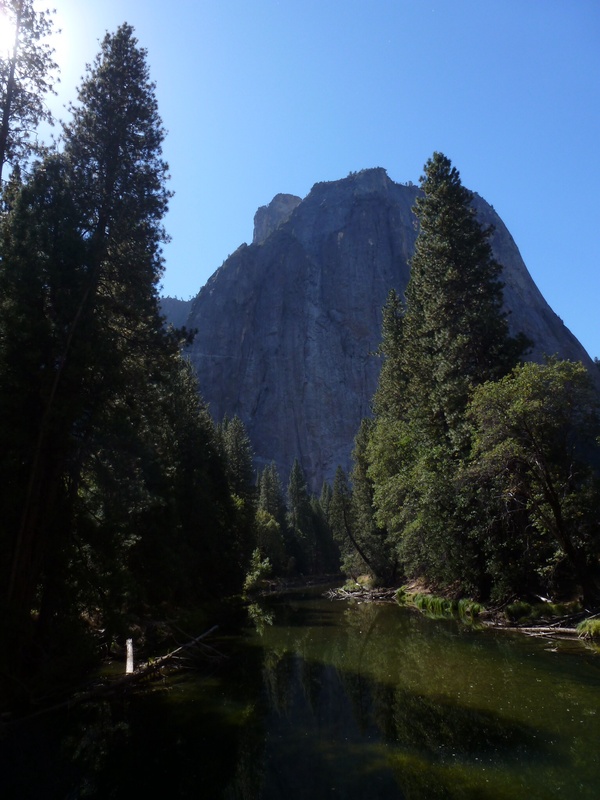 A few miles further along the Merced river and we reached the valley proper. There is a 4 mile one way system (2 miles one side of the river and 2 miles back) along the valley which was really fortunate as this was still the main highway. 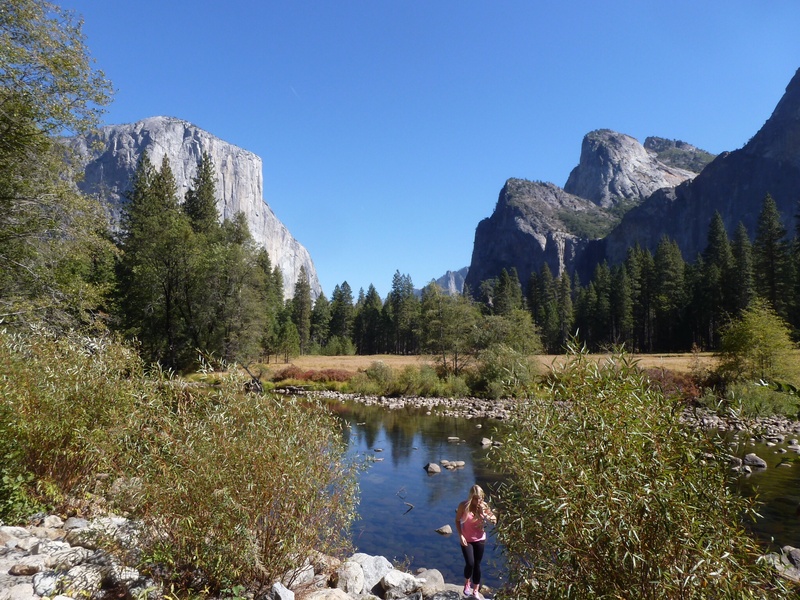 It was an incredible few miles – fantastic views of the towering El Capitan on one side and towering ‘Cathedral Rocks’ on the other with beautiful meadow between. To think we may have gone the other way round and missed this! At the far end of the loop the road further down the valley was firmly closed. We tried to blag to the ranger that we needed to go to the store for more food but were told the shop was only open to those who could show an employee pass. 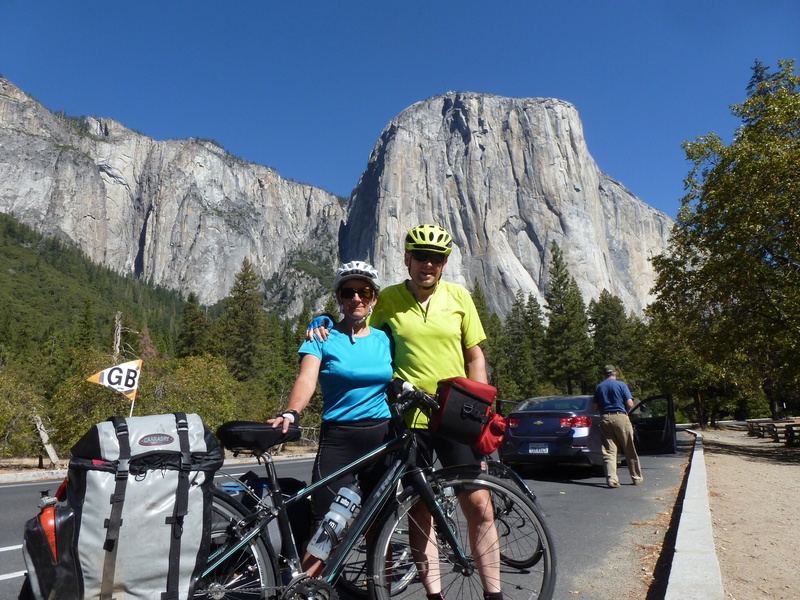 With our panniers, trailer and english accents it was quite apparent that we were not local! The ranger was very pleasant and only doing his job so we peddaled on. Everyone was stopping to take photos and just absorb the amazing sites and the rangers seemed to be turning a ‘blind eye’ to this. I suspect in summer this one way loop is nose to tail traffic so the plus side of the closure is that there was relatively little traffic all day. Disaster for the local businesses who must normally cheer a bright sunny Saturday in October for bringing in visitors. Time to start climbing again, out of the valley, We knew we had a lot to do and we had left relatively late in the morning. However it was impossible to hurry (hurry being a relative term as we plod up hill) because the unfolding views down the valley were even more fantastic. We stopped at what must be our number one picnic spot, known as “Tunnel View”. It was not a view of the road tunnel but the valley below. 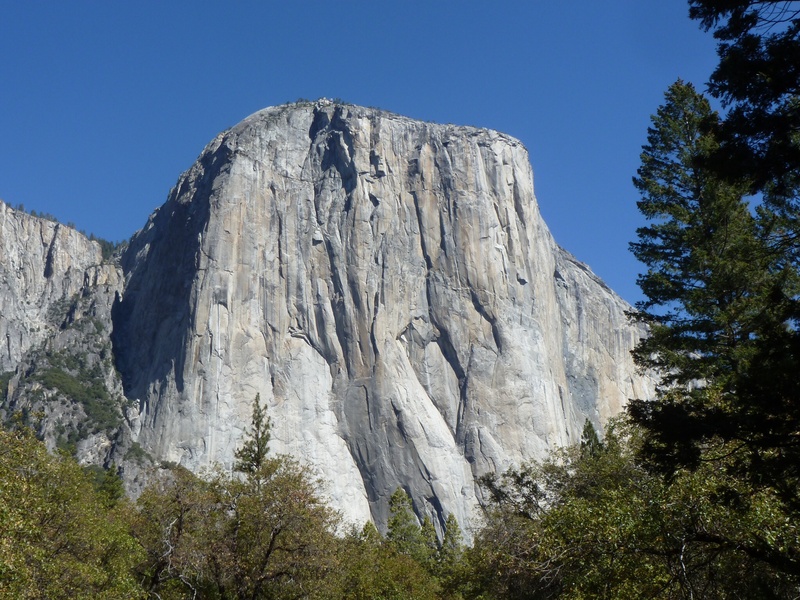 We ate our sandwiches looking right down the Yosemite valley with El Capitan and Half Dome framing the view. The icy power of the the glacier that had ripped the mountains in two was really visibile. Immediately after lunch we had to negotiate and half mile long tunnel (up hill). This was pretty horrible and our flashing back lights seemed very small in the long tunnel and the noise of the cars coming in front and behind was cacophenous. We came out alive at the other end but a bit shaky. 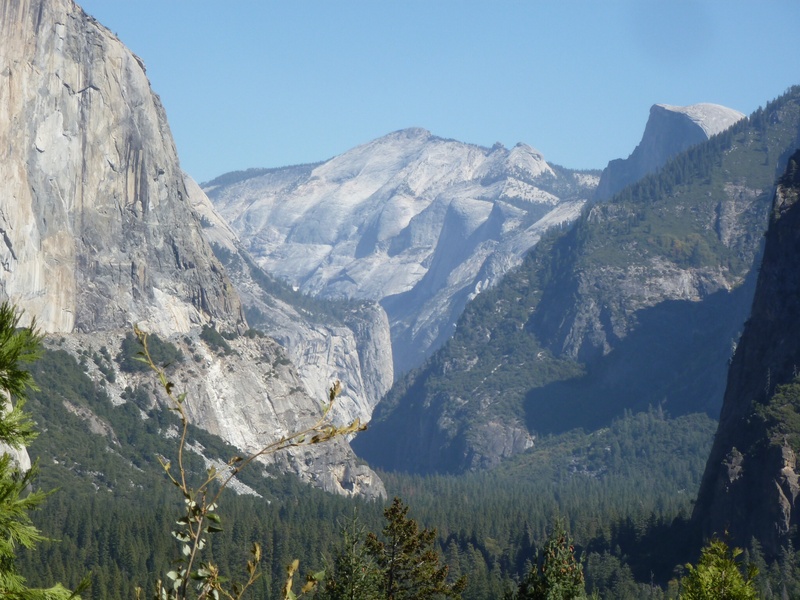 It wasn’t long before we had more fine views to revive us though – last views back down to Half Dome and then views along the wooded Merced Valley. It was hard to believe we were down by the river that morning and then, here we were, right on top of the cliffs we had been staring up at. There wasn’t much between the edge of the road and plummeting hillsides at some points – luckily traffic was very quiet so most of the time could cycle well away from the edge. Not a road for anyone with vertigo! We wound up and up through pine trees 2000 ft then down 2000ft to Wawona in the southern part of the park. The small community was like a ghost town. The beautiful white wooden hotel dating from the turn of the century was all shut up and silent and no one to be seen. It was now 4pm and we had a last 1000ft climb in the evening sun out of the park. We were getting pretty tired and at the top we hit the ‘most climbing done in one day’ record at over 6000ft. The top was a distinctly dowdy place called Fish Camp where we had no inclination to linger. A last downhill to the town of Oakhurst was on good but windy road but with respectful drivers. Oakhurst is a very long strip town with no obvious centre. This is typical of a number of US towns whcih appear to have grown up around a road junction, but without any pivotal place which can be called the town centre. It means that it can be difficult to navigate around because there can be no clear reference point (other than a road junction I suppose). It took us a bit of time to find the RV Park and campground but we finally rolled in at 6.45 and put up our tent in the rapidly fading light. Too tired to cook after 2 very long days we strolled into town and had a surprisingly good chinese meal. ‘Lights out’ was pretty instantaneous on reaching our cosy little tent again. However we had had a fantastice day, seen awesome sights and proved that we were as fit as we had been for many, many years by 2 tough days in a row. But tomorrow will be an “R & R” day. Sounds like a terrific day. I love the Merced and the Valley. Hope that your R&R day is restful.